Track time and measure productivity against any and all modules in SuiteCRM, including support cases and project tasks. Built in start and stop timer, automatic email and screen pop reminders, PDF timesheet templates, advanced reporting and exporting features. Ideal for generating invoices for your clients. Call us at 1-855-50CRMNY (502-7669) for more information or a product demo. The Business Case for Tracking time in your CRM? Want to improve payroll accuracy and better understand how much time your spending on sales, project, and related CRM activities? This module makes tracking time against any module in SugarCRM or SuiteCRM a breeze and generates weekly time sheets for your staff! This Pro edition gives you a dedicated reporting module that allows you to report, and export all your timesheet data from within the system. Want to email a timesheet to your supervisor? This does it in seconds. Want to track how much time you spent on a client project? Do it in seconds. Track Employee Productivity - Learn where your employees are spending time their most time, and report on it. Project Management - Track time against projects in SuiteCRM and measure resource utilization. Customer Support - Track time against customer support cases. Sales - Track sales rep time against opportunities and accounts and determine how long it takes to close deals. Customer Billing - Utilize your time sheets to bill your customers. Track Attendance - Utilize your time sheet interface to track attendance related to CRM users or contacts. Log Time against any module in SuiteCRM. - Easily track time associated to any module in SuiteCRM and their related activities. Including Calls, Leads, Opportunities, Projects, Cases, and any module that exists. Generate Professional Looking Timesheets for Signoff in PDF Format - Export your timesheet to a professional looking timesheet template and easily email them to other people in your company from within CRM. Log time with the Matrix Views- Forgot to log your hours at the end of the week? No problem, log them all from a single view. A Dedicated Reporting Module - A dedicated reporting module for timesheets allows you to easily query all your timesheet submissions and export it into CSV or PDF format. Want to see timesheets only submitted by a specific user or department? This is a breeze in our reporting module. Want to see all timesheets submitted in the last week? This takes 3 clicks! Setup Hourly Rates - If your hourly rates vary by resource or by user, you can set up a user profile rate for automatically billing and generating an invoice in SuiteCRM. Notify Users Automatically - Timesheets Professional automatically notifies your SuiteCRM users when they have not logged time against a project task via email and screen pops. Perfect for time reporting accuracy and compliance. Track how much time your tracking automatically using an automatic timer in SuiteCRM or SugarCRM cases. As you work on the case, an automatic timer can be initiated to start tracking the time. Once you stop the timer, your timesheet is automatically updated. A dedicated reporting module for timesheets allows you to easily query all your timesheet submissions and export it into CSV or PDF format. 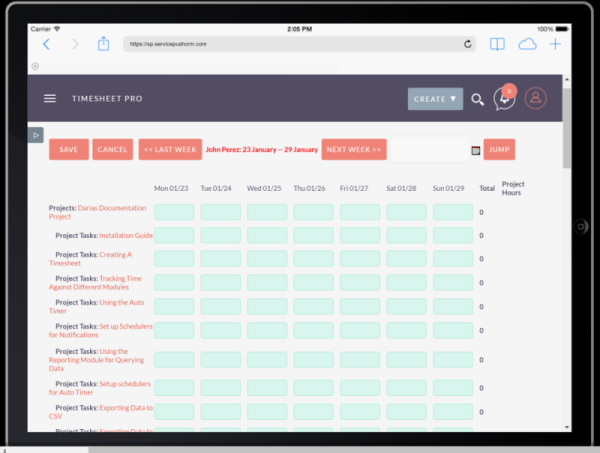 Export your timesheet to a professional looking timesheet template and easily email them to other people in your company from within CRM. Want Pre-Built Reports, Training, and Prioritized Support? We offer an additional package that you can add to your cart. All for a one-time investment of $499. Click here to add this Reports, Training, and Support package to your cart.